If you are looking for the modern RuneScape guide for this content, please see our Sheep Shearer guide. Fred the Farmer's sheep are getting mighty woolly. He will pay you to shear them. Begin by speaking to Fred the Farmer about a quest. 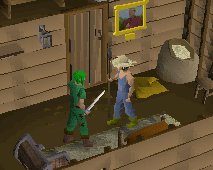 To start this quest, talk to Fred the Farmer who can be found by following the northern road from Lumbridge Castle. He's inside the small house in the Chicken Farm alongside the road. Ask him if he has a quest for you, and he says that he needs someone to shear his wooly sheep, and he asks you to bring back 20 Balls of Wool. Before you leave, grab the Shears on the table. Now leave the house, enter the pen to the east, and now use your Shears with the wooly sheep. Wooly sheep are bigger than sheep that have already been sheared. If the sheep doesn't get away from you, you'll get a piece of wool. After getting 20 pieces of wool, head back to Lumbridge Castle and climb up either ladder. Upstairs is a spinning wheel, which you can spin the wool on. Just use each piece of wool with it to spin it into a ball of wool (gives 2.5 Crafting skill xp). Now go back downstairs, leave the castle and go back to Fred. Once you've given him all 20 balls of wool, you're finished with the quest!